Next time you’re looking for the best place to buying a car online, make sure to check Hyundai’s 2016 Santa Fe. In an already overcrowded crossover and SUV market, the Sante Fe knocks its competition out with the use of Hyundai’s genius engineering, advanced safety features and creative touches that speak directly to the driver as well as the passengers. If you’re looking for the best way your whole family can feel safe, comfortable and stylish this winter, get yourself into a 2016 Hyundai Santa Fe. If the 2016 Santa Fe is going to be your weekend warrior, it’s a solid choice. The powerful 3.3L V6 engine generates an impressive 290 horsepower and delivers 252 lb/ft of torque beating out the Toyota Highlander and Honda Pilot. Should you need to get your boat to and from the lake for the summer months, an additional tow package is available with standard trailer-prep package designed to carry up to 5,000 lbs. A genius in Hyundai engineering is their SHIFTRONIC. Hyundai has mated every Santa Fe engine to their 6-speed automatic transmission to include SHIFTRONIC. Along with this, all models come with an Active ECO System which improves transmission performance to aid in fuel economy. One of the very best things about the 2016 Hyundai Santa Fe is that it’s ready when you are. Say you need to fit 7 bodies on your way to a ski trip, Hyundai’s Active Cornering Control All Wheel Drive (AWD) gives drivers improved traction and greater cornering capability in turns by transferring engine torque to the rear wheels and applying braking force to the inside rear wheel. With better cornering performance and all-weather capabilities, this means no one’s stuck inside all winter with the blues. The 2016 Santa Fe wants you to get outside and enjoy safe transportation during winter months. With DSSM or Driver Selectable Steering Mode, drivers can enjoy a greater sense of control and satisfaction. In choosing one of three of its modes: comfort, normal and an enhanced Sport mode, the steering automatically switches to take on characteristics of said mode. 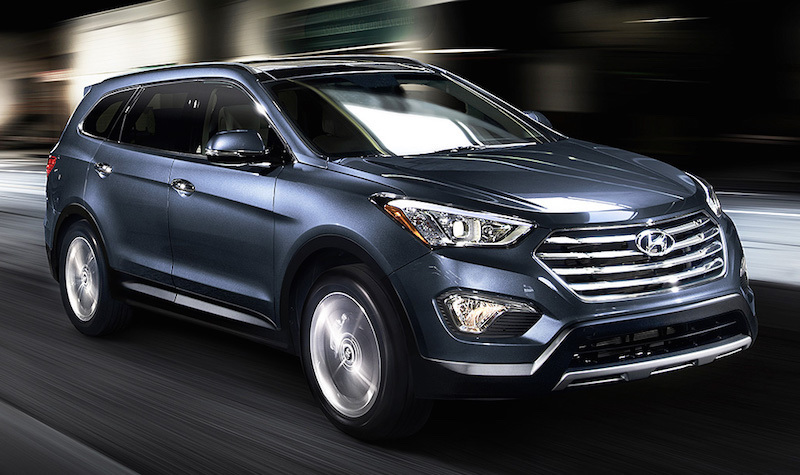 The 2016 Hyundai Santa Fe comes in two trim levels: SE and Limited. Offering a five or seven seat option, the Santa Fe does have make room for the famed third row should you want or need it. If you do opt for the third row, more interior designs are available to you. The Santa Fe Limited offers a rear seat of two captains chairs rather than bench seating. Should second-row bench seating be more compliant with your lifestyle, they fold 40/20/40, and for added flexibility and functionality, slide for easy access to third row or back cargo space. Regardless of who your rear passengers are, they will be particularly impressed with the amount of extras they have that will cater to their specific needs. Heated seats, integrated side sunshades and reclinable second-row seats also slide for easier access to the third row whose two seats have 50/50 split folding functionality.